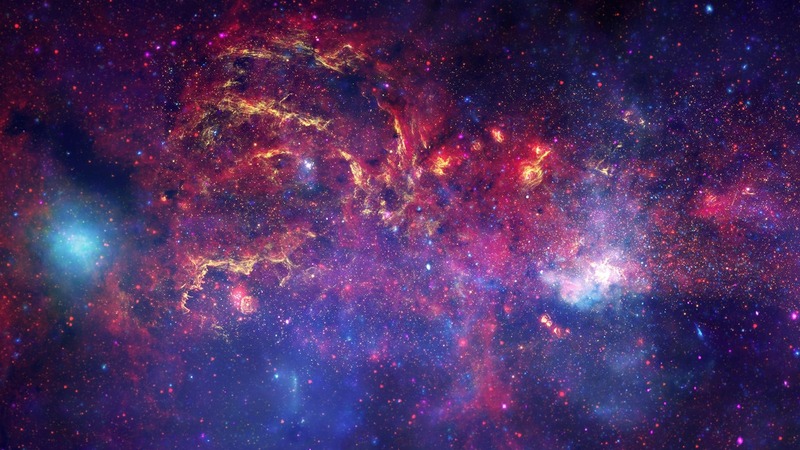 The center of our Milky Way galaxy, about twenty-five thousand light years from Earth, is invisible to us in optical light because of the extensive amounts of absorbing, intervening dust. Radiation at many other wavelengths, however, including the infrared, radio, and energetic X-rays, can penetrate the veiling material. 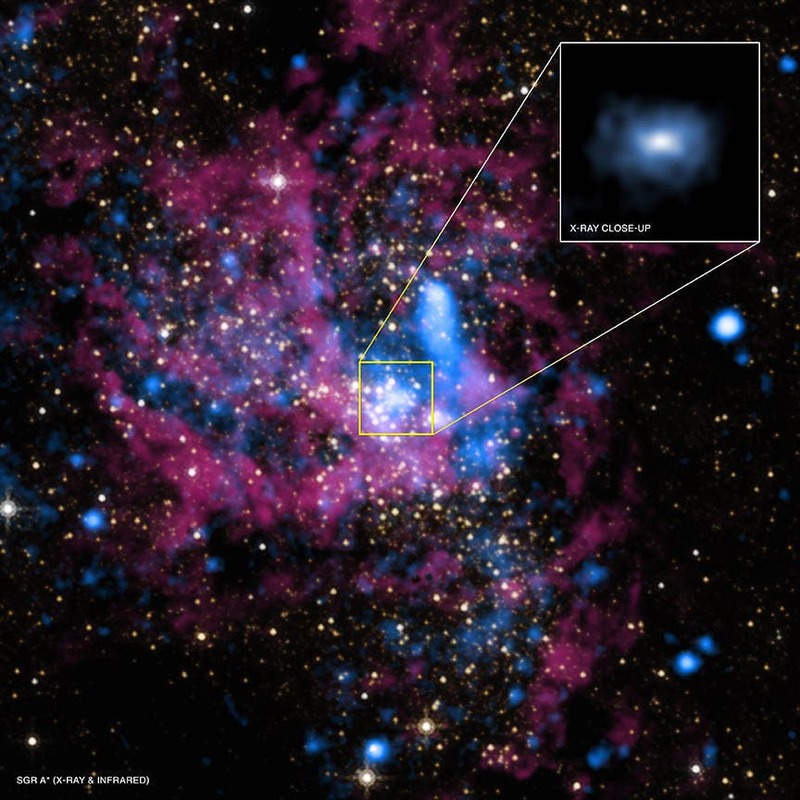 At the heart of the galactic center is a supermassive black hole, SagA*, with about four million solar-masses of material. It is a relatively dim object, and shows some slight flickering that is thought to be the result of small blobs of material randomly accreting onto a disk around it. Its general passivity distinguishes SagA* from many other supermassive black holes in other galactic centers that actively accrete and heat large amounts of material, and then eject powerful bipolar jets of fast-moving charged particles. A few years ago astronomers spotted a large cloud of gas (estimated to be three Earth-masses in size) moving relatively quickly towards SagA*. Some models projected that the cloud (known as G2) would be disrupted by the black hole during 2015, an event that might be accompanied by detectable radiation that could in turn shed light on a black hole's feeding mechanisms. That did not happen; the year passed without any fireworks, possibly because G2 was too dense to break up. The infrared image below shows the region around the nucleus of our Milky Way, the supermassive black hole SagA*. The marker shows the location of the black hole, which glows faintly due to accretion of material; the other objects are stars or dense clouds either orbiting the black hole or in its general vicinity. The size scale of the image end is about one light-year. (Stefan Gillessen and the Max-Planck Institute fur Extraterrestrische Physik). CfA astronomer Michael McCourt and his colleague have been able to make the most out of this recent non-event. They recognized that the ongoing X-ray emission from SgrA** implied an inflow rate of about a few Earth-masses per year from ambient material, but that this rate was inconsistent with almost every other measurement, including among other things the total luminosity of SgrA*. 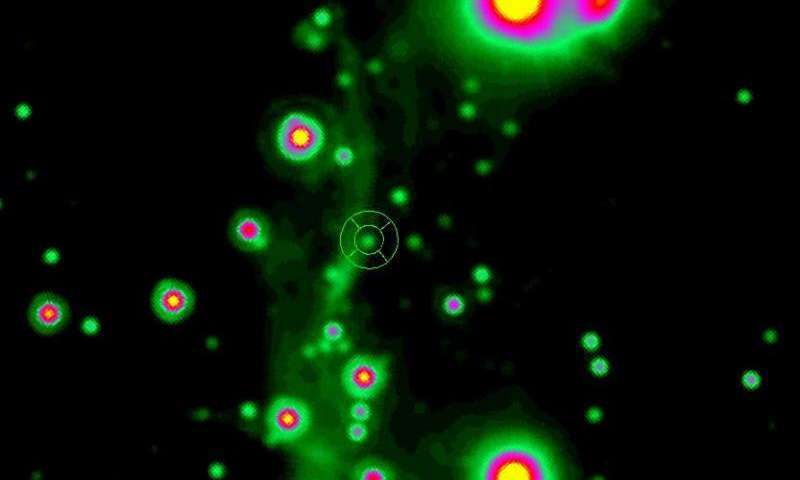 Sorting out the possible solutions required knowing the distribution of the gas very near the black hole – distances less than the distance of the Earth from the Sun. The scientists realized that they could use the changes in the orbit of G2 as it passed through this medium to probe the innermost gas. Even though the object was not devoured as expected, its path would be altered. They also took advantage of a second small cloud in the system, G1, to pin down some parameters as the two traveled during the year along highly eccentric, nearly co-planar orbits around SgrA*. The scientists modeled slight changes in the orbital parameters of G1 and G2 as they moved, assuming the changes were due to encounters with the local material. Their analysis provides the first determination of the rotation axis of the accretion flow, and points to the source of the accretion as being from the large torus of molecular gas that is about 4 light-years from the black hole, rather than from the winds of stars that are present in the intervening volume. The result is an important clue to the nature of the black hole’s environment, and moreover it has some observational consequences that might be tested in the next decade, including the future paths of G2 and G2 and the geometry of the emission close to the black hole's boundary. Reference(s): "Going with the flow: using gas clouds to probe the accretion flow feeding Sgr A∗," Michael McCourt and Ann-Marie Madigan, MNRAS, 455, 2187, 2015. NASA: "Milky Way Center is a Bizarre Place –It's a Mystery"